Observation - Caterpillar - UK and Ireland. 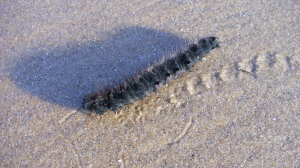 Description: 3 inch long furry caterpillar crawling on the beach in the direction of the sea. Anyone know what it might be? Wind blew it over to reveal underside shot. Nice caterpillar tracks! 3 inch long furry caterpillar crawling on the beach in the direction of the sea. Anyone know what it might be? Wind blew it over to reveal underside shot. Nice caterpillar tracks!